Bonjour! Espero que vc esteja bem, ficamos preocupados! Os peixinhos são graciosos e quanta vegetaçao linda! What a wonderful piece of nature to have at home. I hope watching the fish and plants gives you rest and calm and healing. Magnifique ! J'ai été fan d'aquariums pendant des années, et je reconnais là le travail d'un amateur passionné ! E então, estás melhor? Espero que sim. A floresta tropical ou um jardim de folhagem é sempre lindo. Este tanque de peixes está caprichado. Penso que eles devem gostar. It's great feng shui to have fish tanks in your home... Wonder why we've never done it. Lazy. Besides, we have Mother Nature's fish bowl to dive into so close. Bet you'd love that! Good to see you up and about, José (even should it only be your fingers on your keyboard). Where are those elusive fish? You provided a spectacular environment for those shy ones! Haven't been blogging lately so I missed your illness. I'll try to find it by surfing backwards on your blog. Whatever it was, I hope it's gone! I was away for my son's wedding on a Caribbean island during a cruise, so I did not seen your post about your surgery. I hope that you are recovering comfortably. And I hope that you are surrounded by people more sensitive and tactful than my wife, who tries to prepare me for medical procedures by explaining them to me in terms that are worse than they turn out to be. 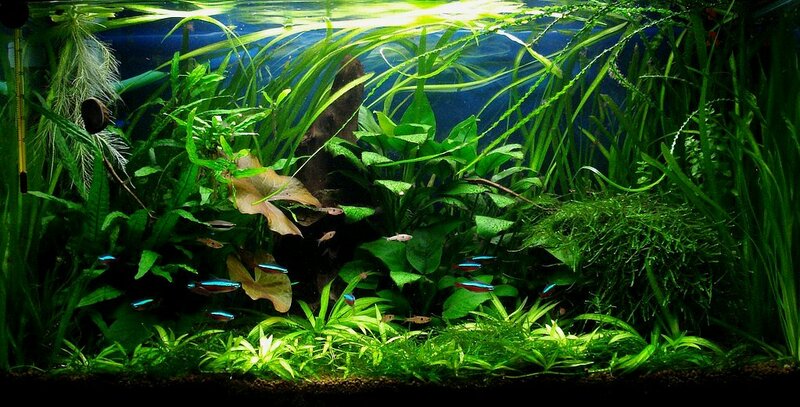 Your neon tetras should help you relax during your recovery. Best wishes. It's like an underwater oasis. I think aquariums are so relaxing to watch. Love the green! Looks better than all this brown around here these days. And this is in your home? What a wonderful way to bring inside a piece of the great outdoors. I would guess it's a great pleasure to just sit and look at it. It sounds as though your operation was more severe than mine. I can understand about not feeling like blogging. I love your aquarium, JM! What a great capture! I do hope you are feeling better and recovering! Take care and have a good weekend! This is a gorgeous fish tank and I love those colorful little fish swimming about. Hope you are recovering well! Glad to see you back on line. This would be very calming to look at. Beautiful! Hope you are feeling better. I'm so happy you are well enough to pick up on your blogging! And I'm so jealous of your fish tank. Now you have me thinking about getting one myself! It wouldn't surprise me if your exotic plants and fish tanks aided greatly in your healing. Not to mention your zest for life. Spectacular and inspiring! how beautiful it is. what pleasure it must give you. Wow you aquarium really looks good! Picture perfect..
How gorgeous! Glad to hear you are feeling much better after your surgery. A beautiful aquarium and you say you have more. What a lovely hobby to have. I hope you are on the mend my friend and watching your fish must have helped you to relax. That is so pretty JM! I could dive right in! Love the Neons. Must have rained a lot in your place, that you have such a nice puddle in your home. And even with neon fish. ;-) Fantastic picture. Glad you are feeling better. Nevertheless, best of luck for the rest of the recovery. Thanks for stopping by. Enjoy your weekend. An indicator of your limited perspective at the moment! I suspect they have a strong calmative effect. Heal well and heal quickly, Jose. I can imagine my cat watching this show, mesmerized. I hope you recover quickly and painless. Well that is lovely and soothing for your recuperation. So wonderful to see you back. That's alot of greenery. That is the lushest fish tank I've ever seen JM, what lucky fishies!! and I hope you are feeling quite recovered from your ordeal, sometimes these things hit you like a ton of bricks, we have missed you.